The field of children's language development is one that encompasses a range of distinct theoretical perspectives. The theoretical issue that has predominated over all the others in this area for the last thirty-five years or more is that of the extent to which children are pre-programd for the specific task of language learning. A related issue is that of whether language is independent of other areas of cognition, or is it dependant upon more general cognitive abilities. A number of distinct theoretical positions have been identified - some of the main protagonists being, as any textbook account will reveal: Chomsky, who believes the child is born with specific linguistic knowledge; Skinner, portrayed as believing that language is entirely a matter of conditioning; Piaget, who sees language development as an outgrowth of general cognitive development; and Bruner, who emphasizes the importance of the social/interactional context in which language development takes place. The terms in which the positions identified above are couched emphasize their differences. However, a reading of the original works of any of these authors reveals that matters are not so simple. Chomsky, for example, has never claimed that all of language is innate: not only has he always accepted that vocabulary has to be learned, but also that certain aspects of grammar are the product of interaction between the child's innate knowledge ("Universal Grammar" in current parlance) and the evidence provided by the language to which the child is exposed. In the current version of Chomsky's theory, known as "Government-Binding Theory", the child's innate knowledge is characterised as a set of principals which, taken together, define the form of a human language. Associated with these principles are parameters (or switches) which need to be set on the basis of exposure to the language of the community into which the child is born (Chomsky, 1986). It is clear, however, that Chomsky sees the main contribution as coming from the child's genetic endowment. He frequently characterises the 'growth' of language as analogous to physical growth and maturation: the development of secondary sexual characteristics at puberty, for example, requires certain environmental conditions (e.g. adequate nutrition) but is guided almost exclusively by internal mechanisms. Chomsky's position is thus, essentially, characterised by nativism and the belief that language constitutes a distinct area of knowledge, separate from the rest of cognition. Bruner, as noted above, emphasizes the critical importance of the social/interactional context of language learning in the young child. However he does not claim that language can be acquired solely on the basis of information derived from the social context in which it is experienced. Rather he describes this as a support system which backs up the child's predisposition to acquire a language system (Bruner, 1975, 1983). The theory which Bruner developed in the mid-seventies made far reaching claims about the importance of the social context for the development of many areas of language. The essential claim was that language was experienced in the context of familiar routines - shared activities which were repeated hundreds of times. It was the opportunities afforded to the child to map linguistic input onto these highly predictable activities that allowed the child to "crack the code" of language. It was argued that not only could the development of vocabulary be thus assisted, but that the child's learning of grammar would be facilitated by the opportunity to map the elements of sentences (semantically defined as 'actor', 'patient', 'goal', etc.) onto actors, objects and events in the real world through joint action and joint attention with familiar adults. This very strong claim has been modified to a considerable extent in Bruner's more recent work. He does not now argue that the child's grammar can be derived from the child's processing of extra linguistic events, but rather that the latter gives the child something to map language on to. Language is now described as an 'autonomous problem space', and one which is distinct from, and not entirely isomorphic with, event representations. The support system provided by the interactional context in which language is experienced helps the child to learn how to use language for communicative purposes (see Harris, 1992, for a recent discussion of these issues). The other two theorists mentioned above, Skinner and Piaget, may now be differentiated from both Chomsky and Bruner in that neither would see language as fundamentally distinct from other aspects of human behavior (in Skinner's terms) or cognition (in Piaget's). Since Chomsky's famous demolition of Skinner's views on language learning in his review of Skinner's (1975) Verbal Behaviour, it is difficult to find anyone who is prepared to admit to taking these views seriously. Nevertheless language intervention programs based on behaviorist learning theory (to be carefully differentiated from recent formal approaches to language acquisition under the name of learnability theory) continue to be used with children whose language development is not proceeding along normal lines - an apparent paradox which will be returned to below. Piaget viewed language development as a part of the child's general cognitive development. He saw language as essentially a development of the child's ability to manipulate symbols (also manifested in such activities as symbolic play) which emerges towards the end of the sensori-motor period of development. The discussion above, in summary, indicates that theorists concerned with the acquisition and development of language may be categorised along at least two dimensions: firstly, according to the emphasis they place on the genetic component in determining the course of development; and secondly, according to the extent to which they view language as a distinct cognitive domain (or behavioral category). While Chomsky and Bruner are typically placed in sharp contrast with another in terms of their respective positions on the heredity/environment dimension, they can be seen to differ less on the other dimension, both regarding language as a 'problem space' in its own right for the child. Seen in this way, it becomes apparent that the typical characterisations, while extremely useful as a shorthand way of making sense of a complex field, over sharpen the (genuine) differences between theorists. This tendency is helped by the fact that many researchers naturally tend to concentrate on those aspects of language in which they are particularly interested: thus Chomsky, while perfectly happy to accept that vocabulary must be learned, is, partly for that very reason, not really interested in it, and tends to trivialise it by comparison with the acquisition of the syntax which he sees, with some justification, as the heart of the system. The impression with which readers may be left is that what is at issue is which one of a number of competing explanations of language acquisition/development is the "correct" one, with the unspoken assumption that the theory which wins out will be the one which explains all of language development. A consequence of this is that many of those with a practical interest in the field see these abstruse arguments as irrelevant to their purposes of helping children who have problems with specific aspects of their language and communication. The tendency to view language as unitary, however, has become increasingly difficult to maintain in the light of recent research. Theorists working in the Chomsky/Fodor tradition (e.g. Fodor, 1983) have argued that the mind consists of a set of relatively independent modules, including one devoted to language. Fodor maintains that there are a number of distinct channels through which information may enter the cognitive system. These channels are referred to as 'input systems', and are regarded as specialised for specific sorts of stimuli. Thus, there are input systems for visual and auditory information, and also one for language. Linguistic information, of course, has to enter through one of the senses, but the argument is that once it is recognised as linguistic in character it is fed to the specific channel devoted to processing this type of input. One implication of this view is that the specific modality in which language happens to be encoded is a very superficial characteristic - a point that will be returned to below in discussing the development of sign language in deaf children. The language input system, and the other input systems, according to Fodor, share certain properties, including those of 'informational encapsulation' (that is, autonomy of operation - their workings are not affected by information available to some other part of the cognitive system), and rapidity of processing. In addition to the input systems, on Fodor's account, there is also a central cognitive processing system, into which the input systems feed information. It is at this point that information from the different input modules can be integrated, and related to other sources of information, such as the individual's store of knowledge about the world, and representations of the immediately preceding utterances held in working memory. Fodor argues that the constraints under which the input modules operate mean that it is possible for cognitive scientists to discover quite a lot about how they operate; the central processor, by contrast, is so complex that it will probably never be amenable to systematic scientific investigation. This last point has been challenged by other researchers, notably Sperber and Wilson (1986). While accepting the general, modularised, account of the mind offered by Fodor, they argue that it is possible to investigate the workings of the central processor. They go on to the propose that this central system operates on the basis of a fundamental principle which underlies all thinking and communication - the principle of Relevance. The basic idea here, insofar as it applies to the interpretation of utterances, is that all acts of communication carry with them the implicit guarantee that the effort of processing and interpreting them will be worth the listener's while. There are always an infinite number of possible interpretations for any utterance, if the listener is prepared to go to the trouble of seeking out new contexts in which to interpret it, but Sperber and Wilson maintain that the first interpretation which is arrived at by the listener which seems sufficiently informative will be the one which was intended by the speaker. Sometimes, of course, the wrong interpretation is arrived at because the listener has processed the utterance in a context other than that which the speaker intended, but it is argued that this explains those occasions when communication does break down because of a lack of shared assumptions between speaker and listener. Just as Fodor has argued that language is one number of distinct modules of which the mind is composed, so it has become increasingly apparent that it is useful to regard the language module itself as consisting of a set of sub modules. This set would minimally include a phonology, a lexicon (or vocabulary), a grammatical component, and a semantics. Some would add a component (or components) covering pragmatics and extended discourse (e.g. Halliday, 1978; Gazdar, 1979) but other theorists (e.g. Sperber and Wilson, 1986, discussed above) view language interpretation at this level as external to the language module proper, and governed by general cognitive principles, which also apply to other aspects of thinking and reasoning. There is good evidence to indicate that the components of language listed above themselves consist of a number of smaller parts - thus the thrust of Chomsky's work within the Government-Binding approach has been to demonstrate that syntax can best be regarded as consisting of a number of sub-theories, or modules (of which the theory of Government and the theory of Binding are two - giving the approach its name). Associated with each of these sub-theories are the principles and parameters mentioned above. This modular approach to the structure of language and cognition in general is clearly inimical to the Piagetian model, which sees the mind as consisting of cognitive processes which are domain-general, and cognitive development as proceeding on all fronts simultaneously. The approach also differs radically from that of Skinner, who sees language behavior as dependent on general learning processes (which are not necessarily even specific to humans). The emphasis on modularity within the language system, however, leads to the possibility of some rapprochement between the theoretical positions espoused by Chomsky and Bruner. Acceptance of the fact that language is a very complex system, with a number of distinct component parts leads to the obvious conclusion that there need not be any one single explanation for the development of language. Indeed the evidence is accumulating that there are certain components of language in whose development the environment plays an important part (e.g. the lexicon - especially in the early stages), and others where the main influence appears to be the child's innately given "language acquisition device" (or Universal Grammar). The situation outlined above has implications for intervention with children whose language is not developing normally. If there are different explanations for the development of distinct components of the system, then, clearly, the course of action taken may well depend on which parts of the system are causing difficulty. Children with Down syndrome are among those whose language is frequently delayed, and some implications of work on the development of both spoken and signed language in hearing and deaf children for this group will be considered below. Early vocabulary development in children with Down syndrome is delayed by 8-9 months on average by comparison with normally developing children (Rondal, 1987, Buckley, 1993), and a similar pattern is observed in later semantic, syntactic and morphological development (although there is considerable individual variation in the extent of delay). One way of boosting early language development in these children that is increasingly advocated is through the use of signs paired with spoken language input (Le Prevost, 1983). Systems of this kind have been used with a wide range of communication disorders over the last 10-15 years, with the most popular ones employing a restricted vocabulary of signs selected from natural sign languages. The primary system in use in the United Kingdom is the Makaton Vocabulary: a set of around 350 signs drawn from British Sign Language (the language of the deaf community in Britain), arranged into a sequence of stages "of increasing complexity and communication priority" (Walker, 1987 - Kiernan, 1987, provides a survey of systems in use). The use of signs with young children with Down syndrome is not intended as a replacement for spoken language, but rather as a way of providing additional input in the early stages of development. The use of sign systems with learning disabled individuals has developed to a large extent in isolation from research work on sign language development in deaf children. One reason for this is that, until recently, there was relatively little relevant information available about sign language development in deaf children, particularly in Britain. This situation is now changing and there have been studies focusing on a number of areas of development which are of potential relevance. One such area is that of the development of sign phonology. It has become increasingly apparent that deaf children's development in the area of the formational/articulatory parameters of signs (the handshapes, movements, and other visual/gestural components of signs) shows striking parallels to the development of the phonological system in hearing children learning a spoken language. Studies of the development of both American Sign Language and British Sign Language (BSL) have shown that deaf children make regular substitutions and simplifications in their early sign production - for example, they replace complex handshapes, which they cannot yet produce accurately, with simpler ones which are within their current repertoire (McIntire, 1977; Boyes-Braem, 1989; Clibbens and Harris, 1989, 1993). For example, the sign COW in BSL is articulated using both hands with the thumbs and little fingers extended from the closed fist. The child studied in the single case study reported by Clibbens and Harris substituted a simple closed fist for this more complex handshape when she first produced the sign. She also showed a number of other substitutions of simpler handshapes for those which were too complex for her to produce. Over time, however, she gradually produced closer approximations to the correct target form of the sign. These findings indicate that the phonological processes observed in hearing children's early spoken language development are not peculiar to the spoken modality, but appear to generalise to the sign modality also - further evidence for the relative superficiality of the modality in which language is expressed. This work on phonological development in deaf children learning sign language is potentially important for decisions about the selection of an initial sign vocabulary for use with children with learning disabilities. Signs which are of functional utility, in that they enable the child to communicate effectively, will not necessarily be those which are easiest to articulate, but the research cited above suggests that it may not be of overriding importance to insist on accuracy of sign production in the early stages (see Fawcett and Clibbens, 1983; Grove, 1990, for some discussion of these issues). Another area in which the study of sign language development in deaf children may have something to contribute to the use of sign vocabularies with other groups is that of the strategies used by deaf mothers to insure that their children can perceive both the signs addressed to them and the features of the communicative context to which those signs relate. Harris, Jones, Brookes and Grant (1986) found evidence that the rate of early lexical development in children acquiring spoken English was dependent on the opportunities afforded to the child by the mother to relate the input to salient features of the nonverbal context. This work indicates that the environment, and, specifically, certain rather subtle aspects of the interaction between mothers and children, can have a major impact on the processors of language development at the point when the child is entering the system. This is generally in line with the social/interactional theory put forward by Bruner (although Bruner originally claimed that not only vocabulary, but much of syntax as well could be explained in this fashion). These early environmental influences are potentially of importance for the later course of development since, clearly, the child who has not acquired a lexicon is in no position to acquire a usable syntax. The finding that it is possible to speed up or slow down the child's entry into the language system has clear implications for the potential efficacy of therapeutic intervention, even, dare one say, for the use of interventions based on behaviorist learning theory. Children whose early vocabulary development is very slow may require systematic learning programs to get them started. Later, their internally guided language learning mechanisms may come into play, but these mechanisms must have the material to work with, and that can only come through interaction with the environment. During the early stages of language development, as noted above, children are confronted with the task of relating the language addressed to them in the nonverbal context in which that language occurs. The task of deaf children learning to communicate in sign language would appear to be particularly difficult, because of the visual nature of the language - but for this very reason sign language development provides a useful test case for theories about how this mapping occurs. Harris, Clibbens, Chasin and Tibbitts (1989), in a follow up to the Harris et al (1986) study discussed above, investigated the strategies employed by deaf mothers to enable their children to perceive both the signs addressed to them and the nonverbal contexts to which the signs related. Four mother-child pairs were observed while the children were between 7 months and 2 years. For all children it was found that over 70% of signs referred to an object or activity which was at the focus of the child's attention, or to an immediately imminent activity which formed part of a familiar routine in which the child was engaged. Many of these signed utterances were also perceived by the children: for all mothers signs with a salient context which were presented within the child's visual field formed the greatest proportion of all utterances, and by 20 months of age over 70% of all utterances fell into this category. By this age, then, most signs were being seen by the children, and were related to aspects of the nonverbal context to which they were attending. An analysis was then undertaken of the strategies used by the mothers to achieve this high concordance between signs and context. There were two main strategy types. The first was to sign within the child's pre-existing focus of attention, moving the sign away from its normal location in order to achieve this where necessary. Thus signs normally located on the mother's face (such as the sign for CAT) would be transferred to the child's face, and the mother would sometimes reach round the child in order to sign in the child's "signing space". The other main strategy was to manipulate the child's focus of attention - this was generally achieved by taking an object to which the child was attending and moving it to a location where the child could see both the object and the sign, without modifying the location of the sign itself. At first sight all the mothers in the study appeared to be very good at providing their children with signed utterances which the children were able to see and which related closely to objects and activities to which the children were attending at the time of the utterance. Mothers were found to sign mainly within the child's pre-existing focus of attention. Three of the mothers achieved this primarily by moving their signs to the child's visual field. The fourth mother, by contrast, tended to rely on bringing objects and activities into, or close to, her own signing space. Although superficially this was an equally effective strategy, in that it provided the child with the opportunity to observe sign and referent simultaneously, this strategy in fact meant that the objects and the activities were under the control of the mother, rather than the child. 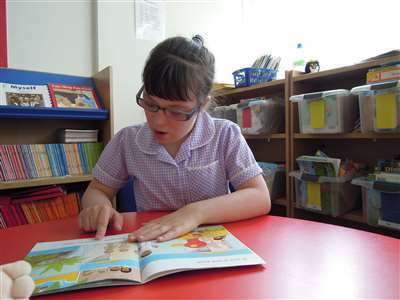 Research with hearing children indicates that it is important for children to have the opportunity to observe the language being used in the context of their own actions, not simply those of others. This may be reflected in the fact that this particular child has very little vocabulary by 2 years of age. There was a general tendency, among the other three mothers, for the displaced signing observed early on to give way to signing in normal location as the children grew older. For two of the children this appeared to be related to a very significant development of an attentional switching strategy by the children, who would momentarily break off from their activity, look up at the mother, and then resume the activity. The mothers would typically use this opportunity to comment on the child's activity through signing, and the children would attend until the end of the signed utterance before looking away. The author, together with a number of collaborators, is currently engaged in a pilot study designed to determine whether the type of analysis of maternal strategies discussed above could usefully be applied in the case of signed input to children with Down syndrome. The pilot study is being conducted using archive data, in the form of video recordings of mothers interacting with their children in a variety of settings. The data analysed to date consist of three recording sessions conducted with a girl with Down syndrome ("Rachel") and her mother between the ages of 9 and 14 months (Clibbens, Powell and Rimmer, forthcoming), and are only briefly described here. Rachel's mother was found to use a variety of strategies for bringing together sign and context. In all three sessions signs presented within the child's pre-existing focus of attention were the most frequent, and, of these, the majority were not displaced but were signed in normal location. Signed utterances were generally grouped into episodes, with the same signs repeated a number of times in connection with the same actions or objects. While Rachel's mother certainly did take advantage of those occasions when Rachel was looking at her sign, she also frequently initiated a signing episode by using a strategy which involved manipulating the child's attention - most commonly through use of her voice, sometimes with some additional acoustic, visual or tactile cue. The first sign in an episode would then typically occur while Rachel was in the process of switching her attention towards her mother, and this would be followed up by one or more signed utterances (in normal location) when Rachel's attention was fully directed towards her mother. By 14 months, Rachel's mother was able to rely more on the child's attention to the signed input. This appears to be borne out by preliminary qualitative observation of the recorded interaction, which indicates that Rachel had developed the ability to switch attention between the context and the signed input in a similar way to that observed in deaf children. Rachel was very responsive to acoustic cues, even at 9 months, so the combination of strategies described above was successful much of the time - a fact which is reflected in the high proportion of signed utterances which were perceived by the child and which had a salient context. It is clear that, when Rachel's mother signed to her, she was highly successful in ensuring that the child perceived both the signed utterance and its nonverbal context. However, inspection of the transcripts of the sessions reveals that the number of signed utterances directed towards the child was quite small in comparison with the number of spoken utterances. It is probable that the number of signed utterances could be greatly increased by the adoption of some of the displaced signing strategies used by deaf mothers - strategies that might not occur to the hearing mother of a child with Down syndrome, who has relatively little experience of signed communication. One strategy which Rachel's mother was observed to use from 12 months, and which did not occur at all in the sample of deaf children and their parents studied by Harris et al (1989), was the strategy of moulding the child's hands into the shape of a sign. It is important to recognise that this is a form of input to the child despite the fact that it is the child's hands that are being manipulated. When considered from the point of view of its effectiveness in enabling the child to perceive both sign and context, the use of moulded signs was one of the largest categories of failed strategies in the 12 month session. Rachel often appeared to take her mother's action, in reaching towards her to mould her hands, as a signal that the interactive episode was over, and would look away from the object being discussed. By 14 months, however, the proportion of moulded signs with a salient contest had increased very considerably, to around 70%. This may well, again, be a consequence of the child's increased awareness of, and attention to, signs. One conclusion that might be drawn from this is that moulding may be more effective once this increased awareness has been achieved. If these findings are confirmed by the analysis of a more extensive data set, they are potentially important in that parents are frequently recommended to use moulding as a form of input from the outset. As the discussion above indicates, a number of practical suggestions have been derived from this work. One possibility is that the use of more displaced signing strategies early on might allow the signed input to be greatly increased in quantity. Clearly this would be at the expense of increasing the number of signs which are not perceived in normal citation form: however, the evidence from early sign language development in deaf children suggests that the most important consideration is to get the child 'tuned in' to the visual channel through which signs are transmitted. Once the children are expecting, and looking for, signs, their parents can revert to signing in normal location. The present data also indicate that, while it would be possible to increase successful signed input to the child by using a wider range of strategies, it is not necessary to do this in order to get the child tuned in to signing. However, if sign/speech pairing is considered worthwhile it may well be possible to produce faster results by adopting some of the strategies used by deaf mothers. It was argued above that the best conception of the nature of language on the present evidence is as a complex system containing a number of distinct components. With such a view of language no single explanation of language development need be adopted: it is perfectly possible, for example, to be a nativist with regard to syntactic development while recognising a major role for environmental effects on early lexical development. There is evidence that this state of affairs is leading to more fruitful interaction between the realms of theory and practice, and the examples of research in the fields of phonological and lexical development discussed show how work which was originally theoretically motivated is leading to practical recommendations for intervention. Boyes-Braem, P. (1989) Acquisition of the handshape in American Sign Language: a preliminary analysis. In V. Volterra & C. Erting (Eds) From gesture to language in hearing and deaf children. New York: Springer-Verlag. Bruner, J.S. (1975) The ontogenesis of speech acts. Journal of Child Language, 2, 1-19. Bruner, S. (1983) Child's talk. Cambridge: Cambridge University Press. Chomsky, N. (1986) Knowledge of language: it's nature, origin and use. New York: Praeger. Clibbens, J and Harris, M. (1989) The acquisition of formational parameters in British Sign Language: a case study. In D. Messer and G. Turner (Eds) Proceedings of the Child Language Seminar, 1989. Hatfield: Hatfield Polytechnic. Clibbens, J. and Harris, M. (1993) Phonological processes and sign language development. In D.Messer & G.Turner (Eds) Critical influences on child language acquisition and development. London: Macmillan, New York: St Martin's Press. Fawcett, G and Clibbens, J. (1983) The acquisition of signs by the mentally handicapped: measurement criteria. British Journal of Disorders of Communication, 18, 13-22. Fodor, J.A. (1983) The modularity of mind. Cambridge, MA: MIT Press. Gazdar, G. (1979) Pragmatics: implicature, presupposition and logical form. New York, Academic Press. Grove, N. (1990) Developing intelligible signs with learning-disabled students: a review of the literature and an assessment procedure. British Journal of Disorders of Communication, 25, 265-293. Harris, M. (1992) Language experience and early language development: from input to uptake. Hove: Lawrence Erlbaum Associates. Harris, M., Clibbens, J., Chasin, J. and Tibbitts, R. (1989) The social context of early sign language development. First Language, 9, 81-97. Harris, M., Jones, D., Brookes, S. and Grant, J. (1986) Relations between the non-verbal context of maternal speech and rate of language development. British Journal of Developmental Psychology, 4, 261-268. Kiernan, C. (1987) Non-vocal communication systems: a critical survey. In W.Yule & M.Rutter (Eds) Language development and disorders. Oxford: Blackwell. Le Prevost, P. (1983) Using the Makaton Vocabulary in early language training with a Down baby: a single case study. Mental Handicap,11, 28-29. McIntire, M.L. (1977) The acquisition of American Sign Language hand configurations. Sign Language Studies, 16, 247-266. Rondal, J. (1987) Language development and mental retardation. In W.Yule & M.Rutter (Eds) Language development and disorders. Oxford: Blackwell. Skinner, B.F. (1957) Verbal behavior. New York: Appleton-Century-Crofts. Sperber, D. and Wilson, D. (1986) Relevance: Communication and cognition. Oxford: Blackwell. Walker, M. (1987) The Makaton Vocabulary - uses and effectiveness. In Proceedings of the First International Symposium on Specific Speech and Language Disorders in Children. Association For All Speech Impaired Children.